Party leaders sought to hold their 1860 nominating convention in the burgeoning Middle Western trade center of Chicago, then a city of some 110,000 people. 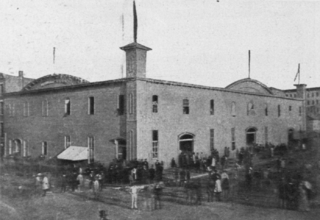 The city had no sufficiently large meeting hall, so an appropriation was made for a temporary wood-frame assembly hall – known as the "Wigwam" – to seat ten thousand delegates, guests, and observers. The rapidly designed and constructed building proved well fit for the purpose, featuring excellent lines of sight and stellar acoustics, allowing even an ordinary speaker to be heard throughout the room. Drawing of the Wigwam interior during the 1860 nominating convention. Note the second story gallery and curved ceiling structure to allow for better acoustics. Lincoln was represented at the convention by his friends Leonard Swett, Ward Hill Lamon, and David Davis. During the night of May 17–18, they worked frantically to win anti-Seward delegates for Lincoln. They showed that Lincoln already had the most support after Seward, which persuaded some. They also made a deal with Simon Cameron of Pennsylvania, who recognized that he had no chance of winning the nomination himself. Cameron controlled the Pennsylvania delegation, and he offered to trade his support for the promise of a cabinet position for himself and control of Federal patronage in Pennsylvania. Lincoln did not want to make any such deal; from Springfield, he telegraphed to Davis "I authorize no bargains and will be bound by none". Despite this restriction, Davis reached an understanding with Cameron, which eventually led to Cameron's appointment as Secretary of War. ^ George O. Seilhamer, Leslie's History of the Republican Party: Vol. 1: Narrative and Critical History, 1856-1898." New York: L.A. Williams Publishing and Engraving Co., 1898; pg. 55. ^ a b c d e f g h i j Seilhamer, Leslie's History of the Republican Party, vol. 1, pg. 56. ^ Proceedings of the Republican National Convention held at Chicago, May 16, 17 and 18, 1860. Albany, NY: Weed, Parsons, and Company. 1860. p. 42. ^ a b c Proceedings of the Republican National Convention held at Chicago, May 16, 17 and 18, 1860. Albany, NY: Weed, Parsons, and Company. 1860. p. 69. ^ Proceedings of the Republican National Convention held at Chicago, May 16, 17 and 18, 1860. Albany, NY: Weed, Parsons, and Company. 1860. p. 75. ^ David Wilmot in Proceedings of the Republican National Convention held at Chicago, May 16, 17 and 18, 1860. Albany, NY: Weed, Parsons, and Company. 1860. p. 5. ^ The Complete Papers And Writings Of Abraham Lincoln. p. 792. ^ Hamand, Lavern Marshall (1949). Ward Hill Lamon: Lincoln's Particular Friend. Doctoral thesis. Graduate College of the University of Illinois. ^ Good, Timothy S. (2009). Lincoln for President: An Underdog’s Path to the 1860 Republican Nomination. McFarland. p. 137. ISBN 9780786453061. Casdorph, Paul Douglas (1962). "The Bogus Texas Delegation to the 1860 Republican National Convention". Southwestern Historical Quarterly. 65 (4): 480–486. JSTOR 30237786. Curry, Earl R. (1973). "Pennsylvania and the Republican Convention of 1860: A Critique of McClure's Thesis". Pennsylvania Magazine of History and Biography. 97 (2): 183–198. JSTOR 20090731. Ecelbarger, Gary (2008). The Great Comeback: How Abraham Lincoln Beat the Odds to Win the 1860 Republican Nomination. New York: St. Martin's. ISBN 0-312-37413-5. Foner, Eric (1970). Free Soil, Free Labor, Free Men: The Ideology of the Republican Party before the Civil War. New York: Oxford University Press. ISBN 0-19-501352-2. Foner, Eric (1980). Politics and Ideology in the Age of the Civil War. New York: Oxford University Press. ISBN 0-19-502781-7. Grinspan, Jon (2009). "'Young Men for War': The Wide Awakes and Lincoln's 1860 Presidential Campaign". Journal of American History. 96 (2): 357–378. JSTOR 25622297. Johnson, Charles W., ed. (1893). Proceedings of the First Three Republican National Conventions of 1856, 1860 and 1864: Including Proceedings of the Antecedent National Convention Held at Pittsburg in February, 1856, as Reported by Horace Greeley. Minneapolis, MN: Harrison and Smith, Printers. Luthin, Reinhard H. (1942). "Indiana and Lincoln's Rise to the Presidency". Indiana Magazine of History. 38 (4): 385–405. JSTOR 27787334. Kellogg, Amherst W. (1921). "The Chicago Convention of 1860". Wisconsin Magazine of History. 5 (1): 99–104. JSTOR 4630342. Roll, Charles (1929). "Indiana's Part in the Nomination of Abraham Lincoln for President in 1860". Indiana Magazine of History. 25 (1): 1–13. JSTOR 27786367. Shutes, Milton H. (1948). "Republican Nominating Convention of 1860: A California Report". California Historical Society Quarterly. 27 (2): 97–103. JSTOR 25156091. Temple, Wayne C. (1999). "Delegates to the Illinois State Republican Nominating Convention in 1860". Journal of the Illinois State Historical Society. 92 (3): 289–298. JSTOR 40193228. Van Deusen, Glyndon G. (1947). "Thurlow Weed's Analysis of William H. Seward's Defeat in the Republican Convention of 1860". Mississippi Valley Historical Review. 34 (1): 101–104. JSTOR 1895998. This page was last edited on 15 March 2019, at 00:12 (UTC).